French President Emmanuel Macron pledges to rebuild the Cathedral after the fire. Offers of help have been pouring in from around the globe after the fire at the Paris cathedral. 2019-04-17 French Prime Minister Édouard Philippe announces an architectural competition to redesign and rebuild the spire of the Notre-Dame de Paris cathedral after it was destroyed by fire. 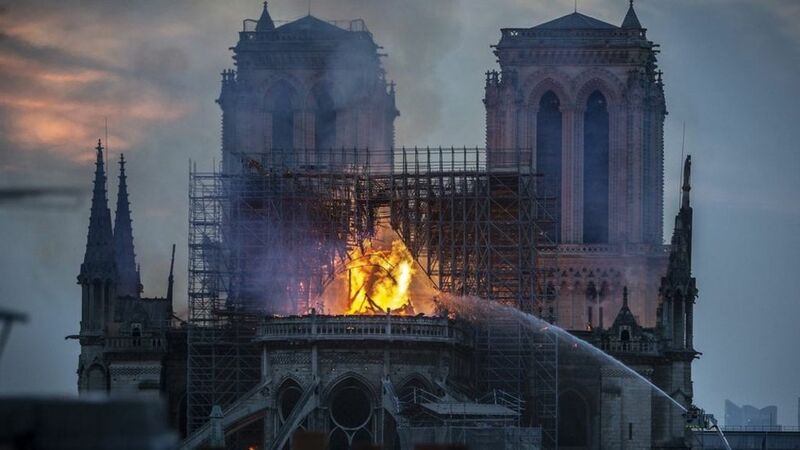 2019-04-15 A fire breaks out at the Notre-Dame de Paris cathedral in Paris, resulting in the collapse of its roof and spire and considerable damage to the building's interior. 2019-03-16 Protests against French President Emmanuel Macron enter a fourth month in Paris. Tear gas is fired at protestors throwing stones at riot police in front of the Arc de Triomphe, news stands are torched at the Champs-Élysées, and a branch of Banque Tarneaud is burned. More than 80 arrests are made. Businesses around the Champs-Élysées are looted. 2018-12-4 Following large protests against French President Emmanuel Macron's planned increases on fuel taxes, French Prime Minister Édouard Philippe announces that these plans will be suspended for at least six months. 2018-12-10 French President Emmanuel Macron addresses the country following the yellow vests protests. While refusing to reinstate a wealth tax or back down on the current reform agenda, he promises an increase to the minimum wage and to remove some taxes on low income earners.